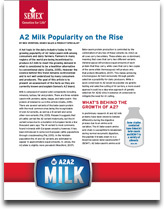 All around the world A2 milk is growing in popularity. Semex bulls are guaranteed to pass on an A2 allele to their progeny. A hot topic in the dairy industry today is the growing popularity of A2 beta-casein milk among consumers and dairy farmers. Farmers in many regions of the world are being incentivised to produce A2 milk to meet the growing demand in what is considered to be a healthier alternative to conventional dairy (Zoetis, 2015). However the science behind this trend remains controversial and is not well understood by many consumers and producers. The goal of this article is to present an assessment of the facts as they are currently known and explain Semex's A2 brand. Milk is composed of several solid components including minerals, lactose, fat and protein. There are three notable casein milk proteins: alpha, kappa, and beta-casein - the protein of interest to us in this article (Zoetis, 2015). There are several variants of the beta-casein protein with the most common ones being the recognizable A1 and A2 variants, as well as a B variant and some other rare variants (Pal, 2015). Research suggests that all cattle carried the A2 variant historically, but the A1 variant arose due to a mutation in European herds a few thousand years ago. The A1 variant is most commonly found in breeds with European ancestry, however, it has been introduced in some non-European cattle populations through crossbreeding (Pal, 2015). In the Holstein population the A1 and A2 variants are estimated to appear in approximately equal amounts. In Jersey, the A2 allele is slightly more prevalent (Woodford, 2007). Beta-casein protein production is controlled by the combination of any two of these variants (ie. A1A2) as all cows carry two alleles. These alleles are co-dominant, meaning that cows that carry two different variants (heterozygous) will produce equal amounts of each protein that they carry, while cows that carry two copies of the same allele (homozygous) will produce only that protein (Woodford, 2007). This makes achieving a homozygous A2 herd exclusively through genetic selection a possibility for dairy producers. While a quick conversion to A2 would be possible via genetic testing and selective culling of A1 carriers, a more sound approach could be a step-wise approach of genetic selection for A2A2 sires in advance of conversion to mitigate the need for A1 culling. 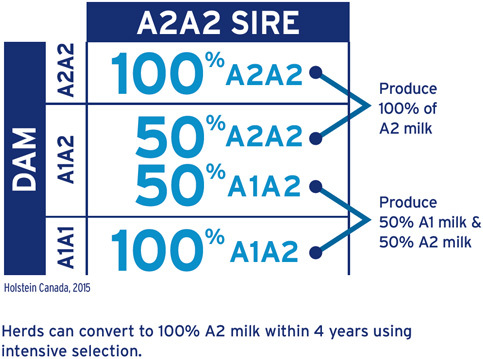 WHAT IS SEMEX'S A2A2 BRAND? Semex has noted the continuous growth in customer demand for homozygous A2 bulls, and in response we have developed our A2A2 brand to help breeders easily identify the bulls and traits they want to incorporate in their breeding programs. Semex's A2A2 lineup are bulls genetically tested as homozygous A2A2 carriers, so they will be guaranteed to pass on an A2 allele to their progeny. These bulls cover a wide range of our lineup including many Immunity+™ sires and top Genomax™ and proven bulls.